The Dow Jones today gained over 100 points in pre-market hours after the U.S. Federal Reserve announced the result of financial liquidity tests. The tests, performed on the nation's largest financial institutions, are designed to provide feedback on the dividend and stock buyback plans proposed by firms like JPMorgan Chase & Co. (NYSE: JPM) and Citigroup Inc. (NYSE: C). 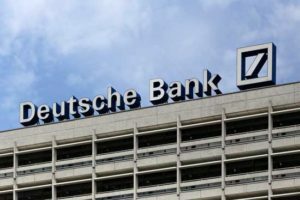 The only capital plan rejected by the U.S. central bank was proposed by the U.S. unit of Deutsche Bank AG (NYSE: DB). DB CEO Christian Sewing promptly said this morning that the German banking giant will not get rid of its American banking unit despite what the Fed described as "widespread and critical deficiencies" in its capital planning. Amazon.com Inc. (Nasdaq: AMZN) wiped out the market capitalization of eight different companies on Thursday, cutting $17.5 billion from its capitalization. The e-commerce giant announced plans to recruit entrepreneurs to deliver local packages, hurting the FedEx Corp. (NYSE: FDX) and United Parcel Service Inc. (NYSE: UPS). Amazon also announced it would purchase online pharmacy PillPack, pushing healthcare benefits companies like Walgreens Boots Alliance Inc. (NYSE: WBA) lower. Shares of Walgreens Boots Alliance Inc. (NYSE: WBA) fell after investment research giant Jefferies downgraded the health benefits firm from a "Buy" to a "Hold." Jefferies analysts said that the deal between Amazon and PillPack will create more difficult market conditions for retail pharmacy chains. Shares of Nike Inc. (NYSE: NKE) popped 10% this morning after the retailer crushed earnings after the bell on Thursday. The sports apparel giant reported earnings per share (EPS) of $0.69, a figure that beat expectations by $0.05. In addition to beating revenue expectations, the company also announced a $15 billion stock buyback program and said that North American sales increased for the first time in 12 months. Shares of Constellation Brands Inc. (NYSE: STZ) fell more than 4.6% after the beer and liquor manufacturer fell short of profit expectations before the bell. The company reported EPS of $2.20 on top of $2.05 billion in revenue. Wall Street analysts were expecting $2.42 per share on top of $2.04 billion in revenue. The company blamed higher transportation costs and a stronger U.S. dollar for its lower profitability. Look for an additional earnings report Friday from Greenbrier Companies Inc. (NYSE: GBX).